Multi-cloud is the use of two or more cloud computing services, including any combination of public, private, and hybrid. The end result is the capacity to orchestrate resources across multiple private or public cloud platforms that contain multiple cloud vendors, accounts, availability zones, or regions or premises. High availability – The multi-cloud provides protection for an organization’s data storage against threats. If a cloud is unavailable, other clouds remain online to run applications. Flexibility – Multi-cloud gives businesses the option to select the “best” of each cloud to suit their particular needs based on economics, location, and timing. Avoid Vendor Lock-In – This allows the application, workload, and data to be run in any cloud based on business or technical requirements at any given time. Cost effectiveness – Multi-cloud enables businesses to control their costs by optimizing the public cloud and choosing infrastructure vendors based on price. Public cloud services deliver functionality without having to hire personnel. Multi-cloud allows you to choose the right platform for your application and customers while using the best features from each cloud service provider. This gives companies the flexibility they need to select the “best” of each cloud to suit their particular needs based on economics, location, and timing. Multi-cloud also provides protection against the failure of a single cloud platform. Large enterprises may also be able to maximize the benefits of different infrastructure vendors that are competing on price for their business (smaller companies won’t have this luxury). What’s the difference between multi-cloud and hybrid cloud? Multi-cloud and hybrid can be mistaken as interchangeable, but the two are very different. The National Institute of Standards and Technology defines hybrid cloud as a “composition of two or more distinct cloud infrastructures (private or public) that remain unique entities but are bound together by standardized or proprietary technology that enables data and application portability.” This means a private on-premises cloud connected via VPN or dedicated connection to a public cloud provider is shared data. A common example of this would be having your database on-premises and your web application in a public cloud provider like AWS. 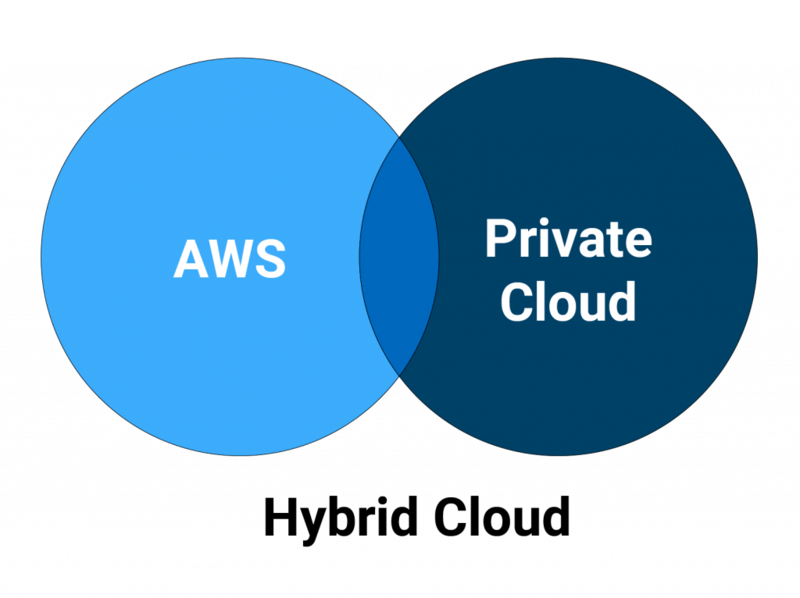 Multi-cloud is similar to hybrid cloud in that it uses both public and private clouds but not necessarily for the same architecture or application. For example, you could run your client-facing application in AWS but run your ERP system in Azure. They don’t have to share data or resources; they can be entirely independent architectures. Multi-cloud differs from hybrid cloud in that it refers to multiple cloud services, rather than multiple deployment modes (public, private, legacy). As you might guess, most enterprises today are multi-cloud. In fact, studies show that 86% of enterprises are using a multi-cloud strategy. What are some of the disadvantages of multi-cloud? Since multi-cloud uses a wider range of cloud services, it is more complex (and often times more expensive) to manage. The most common answer to the multi-cloud complexity problem is a single monitoring dashboard, but this is one of many challenges. Do you have compliance requirements or maintain a configuration management system? You will need to reproduce your governance processes and prepare for audits on multiple platforms as well as rewrite configuration management scripts or other automation tools for each platform. At Logicworks, it took us nearly a year to reproduce our AWS management plan on Microsoft Azure, including items like automated backups, patching, and custom alerts — and we had an entire team of engineers dedicated to this task. Many businesses don’t have this luxury. Businesses often struggle to monitor and control cloud costs on a single platform, and introducing another cloud platform may increase the chances of waste. Is my company ready for multi-cloud? The team at Logicworks has advised hundreds of companies, large and small, about cloud migrations. Since we are a cloud-neutral organization, We offer both public and private cloud services, always recommending what’s best for the customer. We often tell customers that want multi-cloud to make sure their team is operating efficiently on a single cloud first. Start with a limited set of applications on one public cloud platform, and expand to other clouds later. Most companies underestimate the time and cost of cloud management. The unglamourous work of patching, backups, setting up and monitoring alarms, managing users, etc. takes more time than most companies account for. In fact, according to Roadblocks to Cloud Success, 80% of IT decision makers think leadership underestimates the time required for cloud management. Claims by vendors of “all-in-one” or “comprehensive” multi-cloud orchestration dashboards are often overblown. No ISV has mastered multi-cloud orchestration. Since many automation and other tools we use to manage clouds are by nature cloud-specific, it’s unlikely that any software can fix this problem. The idea that you can easily port Docker containers from one cloud to another is much more difficult in execution than many vendors want to admit. This is particularly true if you have compliance requirements, which require a more complex management/orchestration layer and governance requirements. Tackling HIPAA compliance on AWS, Azure, and Google at the same time will set you up for a slow, painful, and expensive migration process. Once your team masters a single cloud platform, think carefully about why you need a second cloud. Is there a real business reason for this added complexity? Is there a specific tool you need from the prospective cloud platform that could be recreated on your current cloud platform? What’s the trade-off between retrofitting your current platform vs. building out an entirely separate cloud environment? If you want to talk about your cloud strategy with a team of Certified cloud experts, reach out to us or book a cloud assessment. We’d be happy to talk through the issues of multi-cloud vs. hybrid cloud vs. single cloud with you in-depth.